For the past 12 months, iSE has been working on an innovative new project, USE IT! (Unlocking Social and Economic Innovation Together). iSE’s role in this 3 year project, funded by ERDF part of the UIA programme, is to work in Ladywood, Handsworth and Smethwick to grow the social enterprise sector, linking local organisations to new markets, linking them to new building initiatives, tourism opportunities and the chance to supply food, heath and creative goods and services to local residents. Our work is delivered through a range of activities and support such as one-to-one support, events, markets, workshops, mentoring and our enterprise skills development programmes. Our focus has been to work at a very grassroots level, local individuals and groups, who are looking to change the communities in which they live. The partners that we are working with have been great at supporting and introducing people to the new Soho Social Enterprise Network (started April 2017) which runs bi-monthly with an expert speaker at each event. Although everyone is welcome, we have established a regular group, some of whom are now starting to set up their own social enterprises! We are delighted with the arrival of our new USE IT! 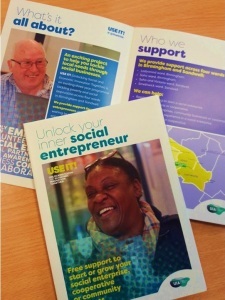 brochures for our social enterprise development and support programme in West Birmingham and Smethwick! You can find out more about the work being delivered by iSE and our USE IT partners across the new Soho Social Enterprise Network by clicking the network link.